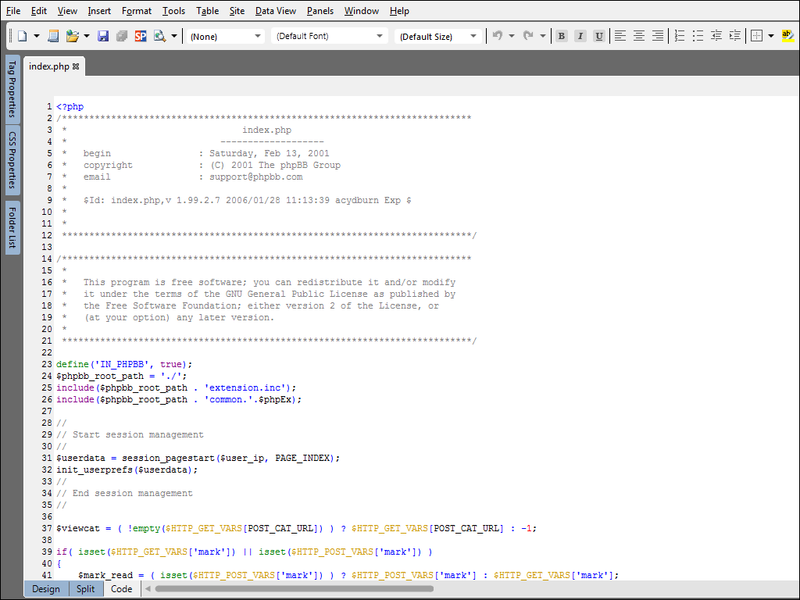 Note: There are a lot of really cool features that are built into EW4, like Search Engine Optimization (SEO) tools, rich extensibility APIs, previewing content side-by-side in multiple browser windows through SuperPreview, built-in support for programming languages like ASP/ASP.NET/PHP/etc. But that being said, in keeping with the main theme of my FTP client series, this review is focusing on just the FTP aspects of EW4 - not the entire product. 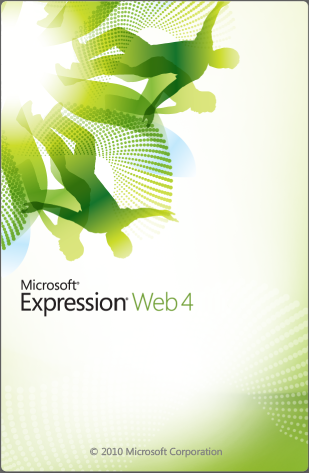 At the time of this blog post, EW4 is a for-retail product that is available as part of the Expression Studio 4 Web Professional and Expression Studio 4 Ultimate suites. 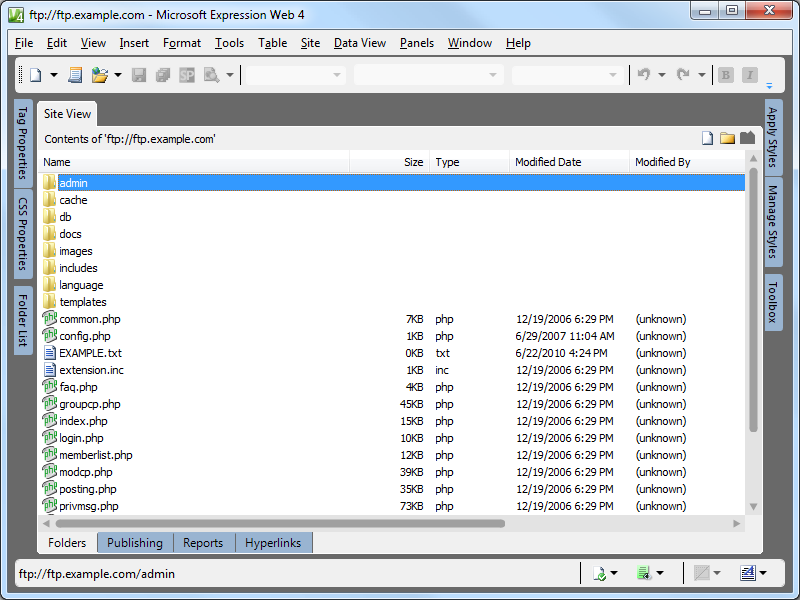 That being said, EW4 is a great web site editor and is a good FTP client, and EW4 is much better than its predecessors. (Note: By "predecessors" I mean earlier versions of Expression Web and FrontPage.) I'll explain more in the following sections of this post. 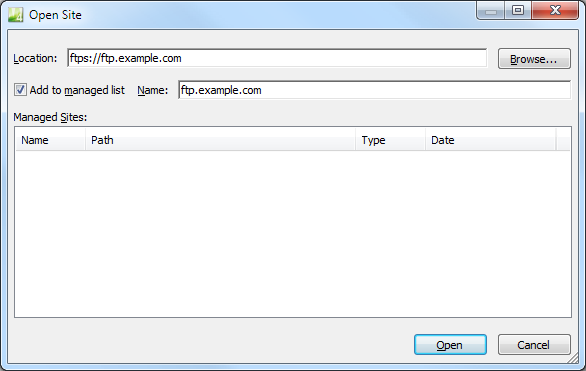 Opening a site is straight-forward, and for the most part the user interface is the same whether you are opening a site over FTP/FTPS or over HTTP using WebDAV or FPSE. 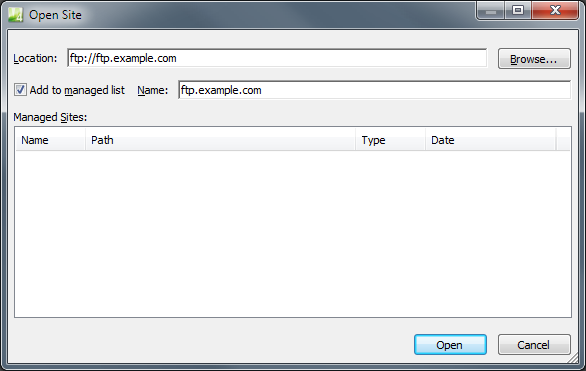 When you are opening an FTP or HTTP site for the first time, your list of managed sites will be empty. As you open sites, the list of sites will be populated for each site there you have the Add to managed sites check box selected. 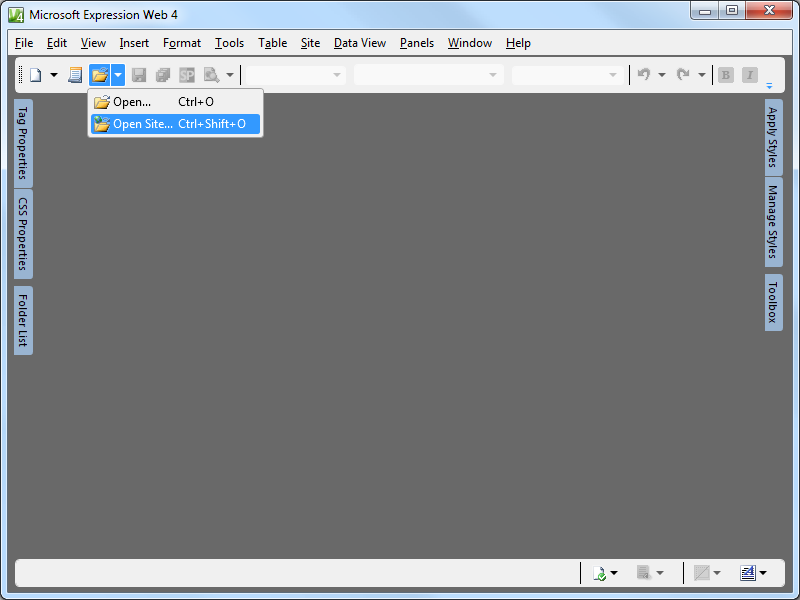 Once you have entered your site information, EW4 will prompt you for your remote editing options. This allows you to choose between editing the live site over FTP or editing a local copy and publishing your changes at a later date & time. Once the credentials have been verified by the FTP server, EW4 will display your site and you can begin editing your content. 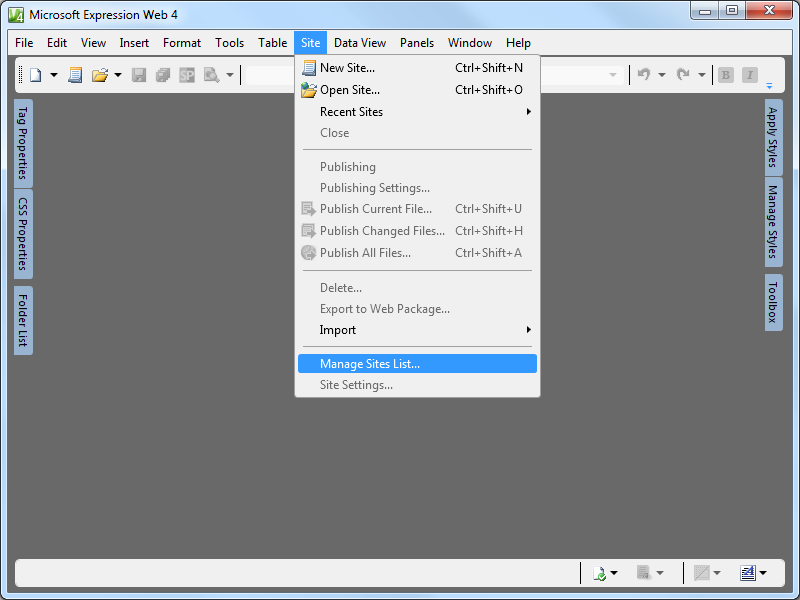 EW4 has some basic site management functionality, which is accessed through the Site -> Manage Site List menu. From there you can add or remove sites from the list. Unfortunately you cannot modify the settings for sites in the list; you have to remove and re-add sites with different settings. 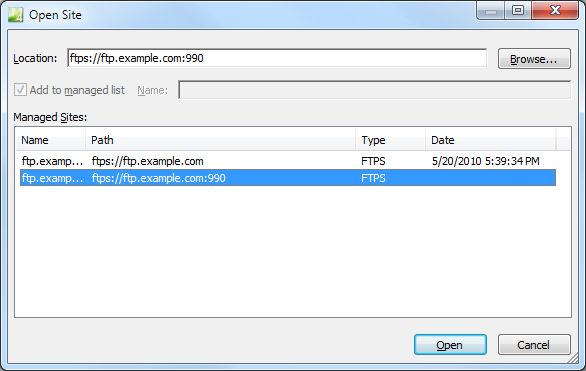 That's it for the simple stuff - now we'll take a look at the specific FTP topics that I've discussed in my other FTP client blog posts. EW4 supports both Implicit and Explicit FTPS, so the choice is up to you to decide which method to use. 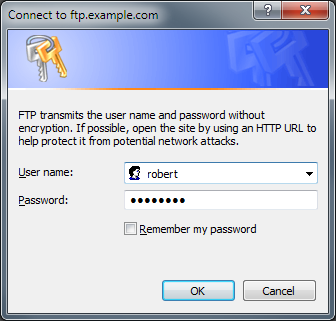 The FTPS method is specified by the port number that you choose when you are connecting. EW4 doesn't have a way of specifying Explicit or Implicit FTPS other than the port numbers listed above. That being said, more often than not you will probably be using Explicit FTPS on the default port (21) so you won't need to enter a port at all. For example, if you are using EW4 with Explicit FTPS on the default port, you can skip adding a port number. However, if you are using Implicit FTPS, you need make sure that you configure EW4 to connect on port 990. Because EW4's login dialog allows you to specify the virtual host name as part of the user credentials, EW4 works great with FTP7's virtual host names. All that you need to do is use the "ftp.example.com|username" or "ftp.example.com\username" syntax when specifying your username, and when you connect to the FTP7 server it will route your requests to the correct FTP virtual host site. Unfortunately EW4 does not have built-in for the HOST command, nor does it have support for entering commands that will be sent before the client has logged in, so you cannot use true FTP host names when using EW4 to connect to FTP7 sites that are configured with host names. 1 As noted earlier, EW4 has no way to send a HOST command, so true FTP HOSTs are not supported.